Eric was born in Missouri, growing up in a town of a few thousand on the Kentucky Bend of the Mississippi River in the southeastern part of the state, forty some miles from Cairo, Illinois, and just across the Big Muddy from an “exclave” of Kentucky, cut off from the rest of the state by Tennessee. It would be a hard place on the map for most of us to find. The name of the town is New Madrid, founded by the Spanish in 1778. If you wanted to live there in those days, you had to become a Spanish citizen and adhere to the rules of the Governor. The town also sits on a fault zone that had over a thousand earthquakes a couple hundred years ago. New Madrid has a rich culture. Eric graduated high school and went on to Vo-Tech for two years to learn welding. He eventually studied architecture at Montgomery College in northern Maryland. “Until things went south.” Another rumble from the underground. When he was able to, Eric went to work in construction and helped build the Embassy Suites by Hilton on I-25. “I’m lucky I didn’t break my neck on that job.” He continued in the building trades, but the labor took its toll. “I enjoyed working construction, but it’s hard on the bones, the knees, the hands.” Eventually, he could no longer do the work, and was back on the streets of Loveland. Eventually Eric’s bones and joints forced him to find a place closer to downtown, where the support network was growing. But so were problems. 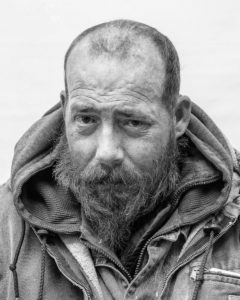 “I’ve noticed the homeless community has increased. A lot. There’s always that one bad apple that makes everything tough for the rest of us. When I first got here it was good, and there’s still a lot of good people in Loveland. Over the years, though, it’s changed, and there’s a lot of new hobos coming in. A lot, a lot of drugs. That really bothers me. You get offered drugs every day. I’ve even had people ask me where to buy drugs. I guess they must think I’m an addict. I won’t touch any of that stuff.” He mentions vodka, “That stuff smells like gasoline,” and heroin in particular. “I saw a friend of mine lose his entire family over that crap.” And, of course, there’s meth.